Life is full of surprises that are not always the kind we would wish for: A relationship suddenly ends. An illness interrupts our life. A career path doesn’t go as planned. A project we poured everything into doesn’t bring the results we expected. Or we’ve checked everything off our life checklist and still don’t feel fulfilled. 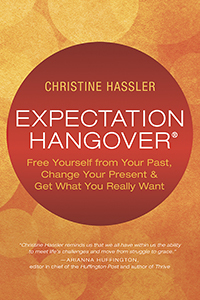 While these kinds of disappointments are a normal part of the human experience, bestselling author Christine Hassler’s new book, Expectation Hangover: Overcoming Disappointment in Work, Love, and Life, promises that they can become the best thing that ever happened to us, once we learn to leverage disappointment to gain something from it rather than only suffering through it. We hope you’ll enjoy this short excerpt from the book, in which Christine gets to the bottom of why Expectation Hangovers happen in the first place. We are all consumers of expectations. They are easy to come by — from parents, family, friends, the media — and many are self-created. Maybe it’s to be successful, get married, have children, look good, make a difference, please others... The list is endless, especially in today’s world, where there are constant opportunities to compare ourselves to others and look for ways to be more, better, or different. Never before have expectations been so high in terms of what humans are capable of, and this creates a paradox of opportunity and pressure. Expectations are pervasive in our lives, and most of us are conditioned to be driven by them and to attempt to realize them. But we didn’t start out that way. We are all born in a state of pure Love where there are absolutely no expectations. Think of it as our “original innocence.” When you were born, you knew these Truths: You are whole and complete. There is absolutely nothing wrong with you. You are worthy and deserving. You can trust the Universe. You have a deep inner knowing. You are connected. All there is and all that matters is Love. You are Love. And then you got older. And things happened that moved you out of love and into fear: someone criticized you; you only got praised for your accomplishments; someone left or wasn’t there for you; you saw people fighting or got yelled at; your heart got broken; you were told your dreams were impossible; you felt incredible pressure to succeed; you got rejected; you made a mistake and judged yourself a failure; you compared yourself to others and believed they were better in some way. Or perhaps you had a blissful childhood and grew up expecting the adult world to be the same way. The moment you got your first reality check in the form of a disappointment was the moment you moved into fear. When in the grip of fear, we experience disconnection and a sense of emptiness. The voice of our ego and the voices of others become much louder than our inner voice and Spirit, and we feel alone and separate. To manage the disconnection, we start to be driven by what we expect will make us feel loved again. To fill the emptiness, we create expectations of what we believe will fulfill us. Our expectations then become our compass, which often navigates us right into an Expectation Hangover. • Things don’t turn out the way you thought, planned, or wanted them to. • Things do turn out according to your plans and desires, but you don’t feel the fulfillment you expected. • You are unable to meet your personal and/or professional expectations. • An undesired, unexpected event occurs that is in conflict with what you wanted or planned. One of the most challenging parts of an Expectation Hangover is feeling that we’ve failed, that we haven’t met the standards or goals we’ve set for ourselves — especially if we’ve poured our hearts into the attempt. Good question. During my own Expectation Hangovers, I have wanted to know exactly why it was happening, both so I could do something about it and so I could counteract my uncomfortable feelings of uncertainty. We think that if only we knew why something was happening, we could change it and not have to endure the Expectation Hangover. The main reason disappointment happens is to teach us paradigm-shifting life lessons. An Expectation Hangover is a wild card that causes us to start looking within and, ultimately, to turn in a different direction. On the surface Expectation Hangovers might appear to create disharmony, but they actually have a harmonizing effect because the unexpected is what leads to innovation and novelty. Adapted from the book Expectation Hangover: Overcoming Disappointment in Work, Love, and Life © 2014 by Christine Hassler.